Whole Foods Market stores is voluntarily recalling 365 Everyday Value Organic Raisin Bran because the product contains undeclared peanuts that were not listed on the product label. Whole Foods Market stores is voluntarily recalling 365 Everyday Value Organic Raisin Bran because the product contains undeclared peanuts that were not listed on the product label. People who have an allergy or severe sensitivity to peanuts run the risk of serious or life-threatening allergic reaction if they consume this product. The affected product was sold in Whole Foods Market stores in the U.S. and online at Amazon.com. The product was packaged in 15 oz. 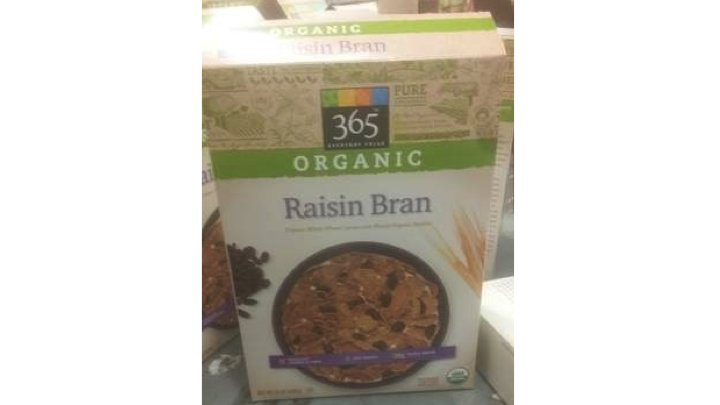 boxes labeled 365 Everyday Value Organic Raisin Bran with UPC code 9948243903 and best-by date of June 4, 2018. The issue was discovered after Whole Foods Market determined the packaging contained Peanut Butter Cocoa Balls instead of Organic Raisin Bran. All affected product has been removed from store shelves and online. No reactions have been reported to date. Customers who purchased this product at Whole Foods Market can bring a valid receipt into stores for a full refund. Customers who purchased the product online will receive additional information via email. Consumers with additional questions can call 1-844-936-8255 between the hours of 7:00 a.m. and 10:00 p.m. CST, Monday through Friday, or 8:00 a.m. and 6:00 p.m. Saturday through Sunday.